"Return of a King: The Battle for Afghanistan " is an exhaustive account of First Anglo-Afghan War (1839-1842). I highly recommend this book. It is a very beautifully crafted and well-referenced book with judicious use of sources. The writing is very lucid and the author makes this complicated episode of history very clear and understandable. The book is very engrossing and it draws you in. It has copious references from Afghan sources which i think sets it apart it from other books in English language on the same subject. The mid-nineteenth century Afghan works in Farsi language used by William Dalrymple are not published in other languages. 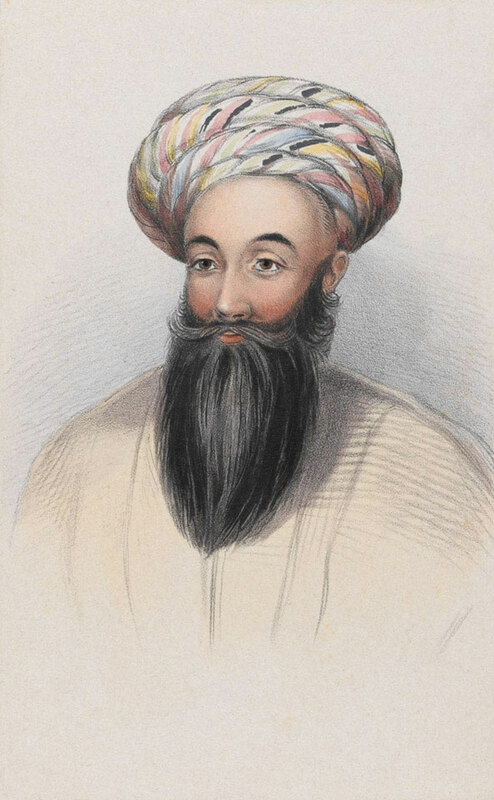 Among the Afghan sources, the most interesting were autobiography of Shah Shuja (written in 1836) and its supplement by Muhammad Husain Herati (1861), Naway Ma'arek of Mirza Ata, Muharaba Kabul wa Kandahar by Munshi Abdul Karim (1851), Akbarnama of Maulana Hamid Kashmiri (1840s) and Jangnama of Ghulam Kohistani (1840s). In my opinion the book satisfactorily explains the reasons as to why British occupation of Afghanistan in 1839-1842 ended in a great disaster. The author is as neutral as any non-Afghan historian could be in writing the history of First Anglo-Afghan War. He does justice to that part of the war in which the 'Army of retribution' committed war crimes against Afghans. Its not a complete story of the war though and many events are omitted. "It is certainly true that the Shah was a deeply flawed man and made many errors of judgement. He was rarely an impressive leader in war and his arrogance and hauteur alienated potential followers throughout his career; as William Fraser noted soon after he crossed the frontier into British India for the first time in 1816, he was indeed ‘very Ultra-Royal in his wishes and expectations’. This belief derived from Shuja’s essentially Timurid view of his own kingship: as he wrote to Lord Bentinck in 1834, he believed himself to be ‘under the special protection of God’. Yet, for all this, Shuja was a remarkable man: highly educated, intelligent, resolute and above all unbreakable. Throughout his life he was fated to suffer desperate and repeated reverses, often for reasons quite outside his own control, but he never gave up nor ever gave way to despair. ‘Lose no hope when faced with hardships,’ he wrote in his youth while on the run after the blinding and deposition of his brother. ‘Black clouds soon give way to clear rain.’ This optimism remained a strength throughout his life. Observers constantly remarked on his ‘grace and dignity’, even in the most adverse circumstances. 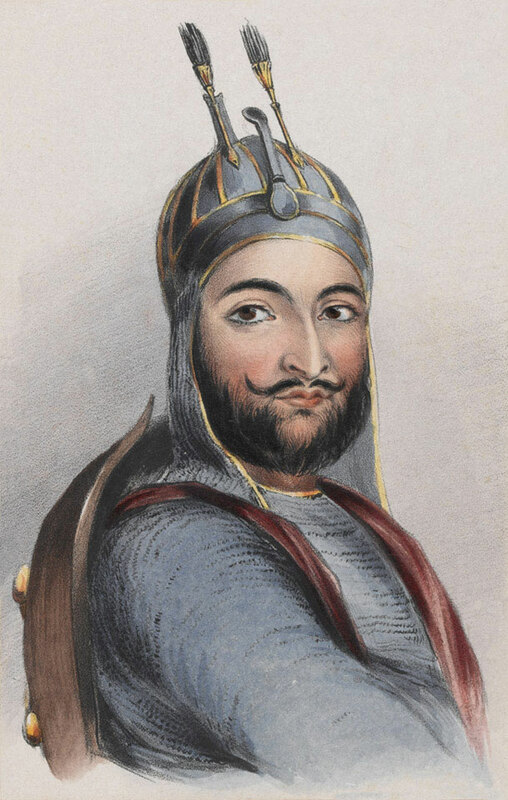 The British called him ineffectual, and Burnes in particular mocked him as the man who lost the kingdom of his ancestors; but when the moment of crisis came at the outbreak of rebellion in November 1841, Shuja was the only figure in Kabul to offer an effective military response, and the only person who made any attempt to save Burnes, even though Burnes had always done his best to humiliate him. Shuja was always unusual for his honourable loyalty to his allies and his faithfulness to his agreements, in a region not known for either. 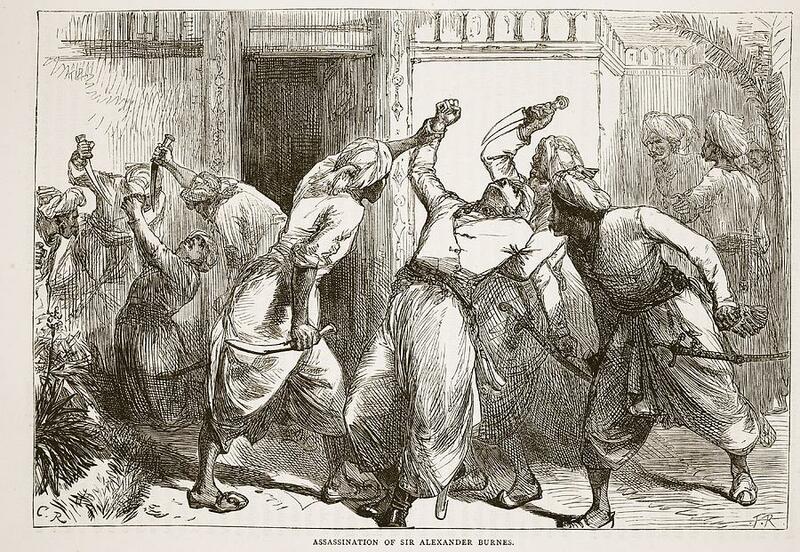 This was one reason he never forgave the Barakzais for breaking the arrangement made between his grandfather, Ahmad Shah Abdali, and Dost Mohammad’s grandfather, Haji Jamal Khan, that the Sadozais would rule as King, with the Barakzais as their faithful servants.."
"The Afghans of Khurasan have an age-old reputation,’ wrote Mirza Ata Mohammad, "that wherever the lamp of power burns brightly, there like moths they swarm; and wherever the tablecloth of plenty is spread, there like flies they gather." " Afghans still regarded themselves as sophisticates, and Mirza ‘Ata, the most articulate Afghan writer of the period, sounds like Babur when he talks proudly of Afghanistan as ‘so much more refined than wretched Sindh where white bread and educated talk are unknown’. 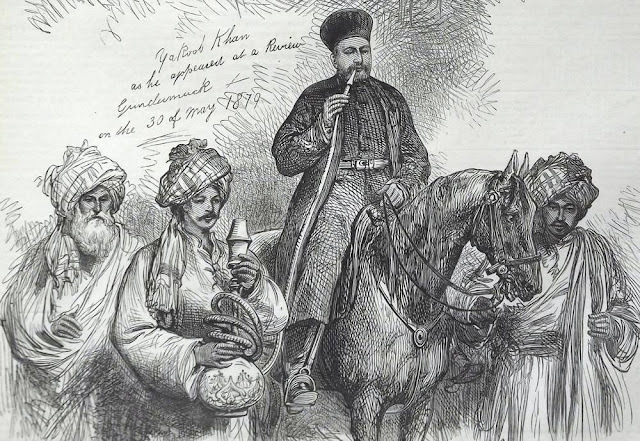 Elsewhere he talks of his country as ‘a land where forty-four different types of grapes grow, and other fruits as well – apples, pomegranates, pears, rhubarb, mulberries, sweet watermelon and musk-melon, apricots, peaches, etc – and ice-water, that cannot be found in all the plains of India. The Indians know neither how to dress nor how to eat – God save me from the fire of their dal and their miserable chapattis!’"
"Like Babur, the first Mughal Emperor, Shah Shuja crafted a beautifully written autobiography where he talks of his days as a homeless wanderer on the snow-slopes of the Safed Koh, padding around the silent shores of high-altitude lakes of turquoise and jade, waiting and planning for the right moment to recover his birthright." 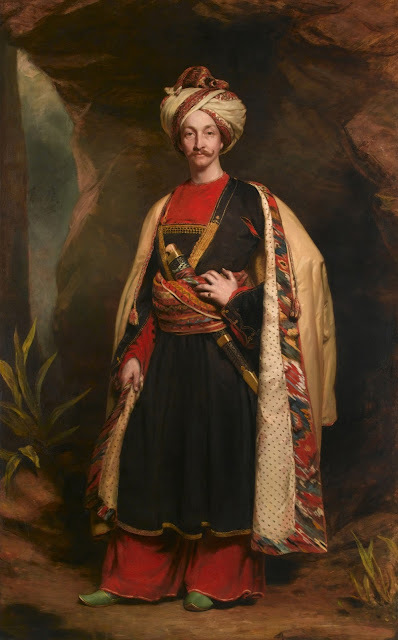 "On his way towards Peshawar, Elphinstone had been immersed in Tacitus’ account of the German tribes confronting the Roman Empire, and in his diary he transposed the action to his current situation: he imagined the Afghans to be like the wild Germanic tribes, while the ‘decadent Persians’ were the soft and dissolute Romans. Yet when he was finally led in to see the Shah, Elphinstone was astonished by how different the cultured Shuja was from his expectations of a rough barbarian chief from the mountains"
"The tribes’ traditions were egalitarian and independent, and they had only ever submitted to authority on their own terms. Financial rewards might bring about co-operation, but rarely ensured loyalty: the individual Afghan soldier owed his allegiance first to the local chieftain who raised and paid him, not to the Durrani shahs in faraway Kabul or Peshawar. Yet even the tribal leaders had frequently been unable to guarantee obedience, for tribal authority was itself so elusive and diffuse. As the saying went: Behind every hillock there sits an emperor – pusht-e har teppe, yek padishah neshast (or alternatively: Every man is a khan – har saray khan deh)." "In his memoirs, he recounted how he [Shah Shuja] took comfort in the example of previous monarchs who had lost their kingdoms only to regain larger dominions later in life: ‘Amir Timur [Timurlane], among modern rulers, was twelve times driven from Samarkand,’ he wrote, ‘while among the ancients, Afrasyab fought Kai Khusro in seventy battles, was defeated over and again, but never gave up. 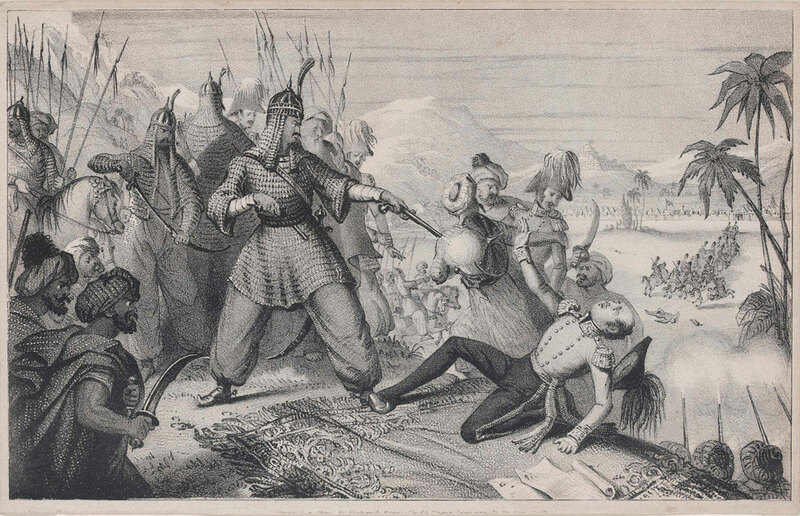 In the same way [the Mughal Emperor] Humayun inherited the provinces of India, but was defeated by Sher Shah and was forced to flee and beg help from Shah ‘Abbas Safavi in Iran. In truth, unless God wills it, nothing will succeed. 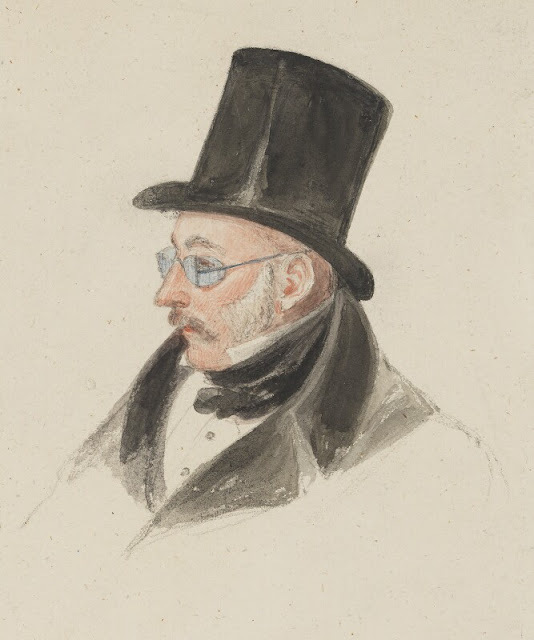 But when God wills it, we shall surely be successful"
Sir Alexander Burnes, 1834. 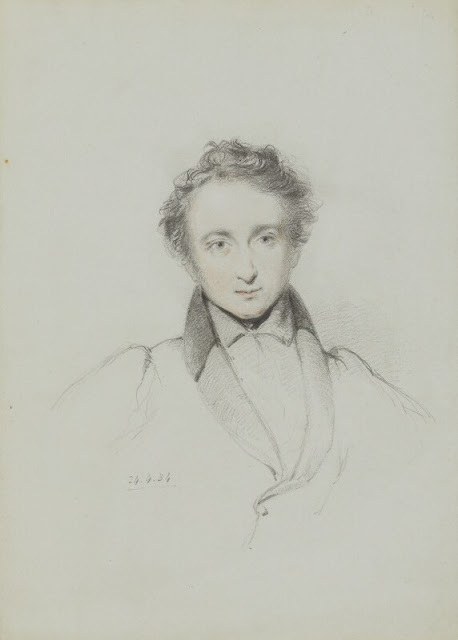 By William Brockedon.